This is a pretty amazing discount. 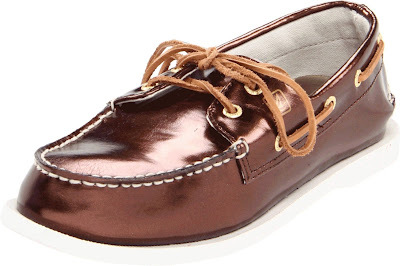 These bronze Sperry Top-Siders are currently marked down to $10.22 with free shipping at Amazon. That is 81% off the full price!!!! This is almost a ridiculous deal. And, upon publishing this post, the following sizes qualified for this price: 5, 8, 9, 11, 11.5, 12. This shoe comes in many colors, though the 81% off only applies to the bronze. 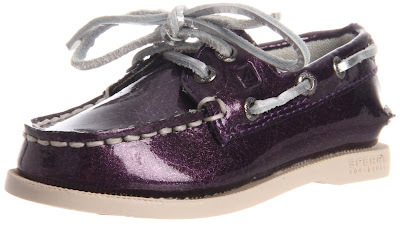 However, if you would like something a little more jazzy, the plum patent Top-Siders are marked down to $19.49 (65% off) and also qualify for Amazon Prime and Super Saver free shipping. Time to sign those kids up for sailing lessons. And you can, with all of the money you will save on their sailing shoes. welp, my girl better like these....i bough them in 3 sizes. can't pass up that price! I'm glad that the sizes lined up right for you. Enjoy the weekend!